The work of intelligence is increasingly performed by software. These tasks operate on an ever-growing corpus of audio-visual material, text, and data produced by the electronic traces of daily life. These archives theorize media not as the end goal of a task of collection, but as the first step in a series of algorithmic interrogations with each new layer of metadata providing a new layer of abstraction on which to operate. Simultaneously embracing operational methodology and attempting to amplify its limits, the Unreliable Interrogator procedurally analyzes public domain audiovisual documents gathered from the SSCI, one of two elected civilian bodies with oversight over the US Intelligence Community. Oversight denotes “the act of overseeing”; a privileged view from above, surveillant supervision. But it also means “to disregard”, a failure to notice. Seeing and not seeing. In the cinematic language of a committee hearing, camera changes almost always correspond to speaker changes. These are discursive markers, and provide an opportunity to temporally map the procedural form of the hearing. A long shot might be an opening remark or recited testimony, short ones may signal a Q&A or series of interruptions. The images displayed, which represent the ‘difference’ between frames of video, are produced in the browser. Abram Stern is a new media artist who is interested in media archaeology, participation, panoptics and the public domain. Much of his work involves the mapping and animation of large corpora of government-produced video. 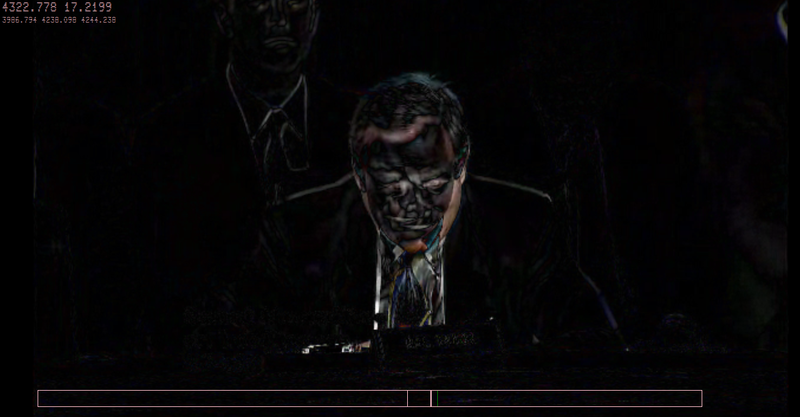 His current project, “The Unreliable Interrogator,” is a distributed browser-based analysis of Senate Intelligence Committee footage using computer vision and audio analysis. He is co-author of an article on open government and open video in Information Polity. His work has been exhibited at the Beall Center for Arts and Technology, Works|San Jose, the McDonough Museum of Art, New Langton Arts and various online fora. Abram is a PhD student in Film and Digital Media at UC Santa Cruz.